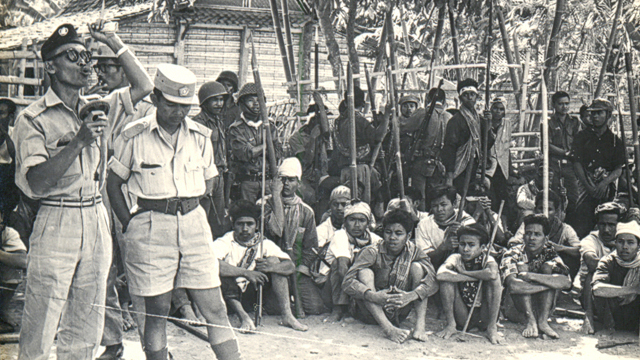 Army officer briefs soldiers and local militia members about the campaign against the PKI in a village in Central Java, ca. 1965. Source: National Library of Indonesia. Suspected PKI members detained by army and anticommunist militias near the base of Mount Merapi, Central Java, ca. 1965. Source: National Library of Indonesia. Left: Member of the anti-communist Pemuda Marhaen militia holding a machete, Bali, ca. 1965. Source: National Library of Indonesia. 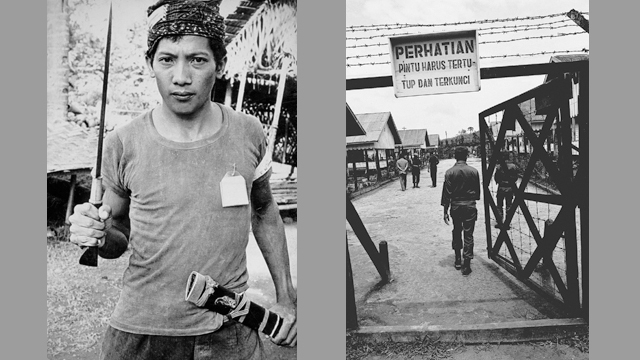 Right: Entrance to the Sumber-Rejo prison camp in East Kalimantan, 1977. The sign reads: “Attention: Gate Must Remain Closed and Locked.” Photo: David Jenkins. Left: Women political detainees pray in Plantungan prison camp, Central Java, 1977. Photo: David Jenkins. 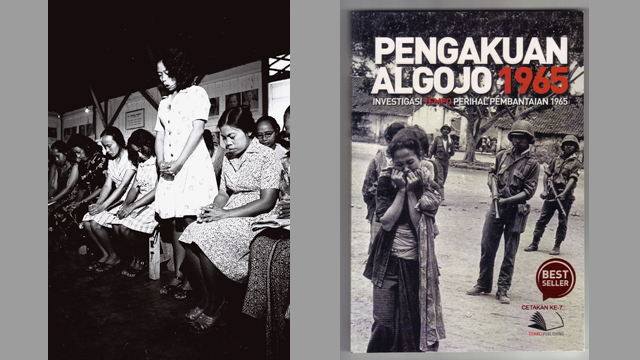 Right: Cover of special issue of the weekly Indonesian magazine Tempo titled “Executioners' Confessions 1965,” published in 2012. Source: Tempo. 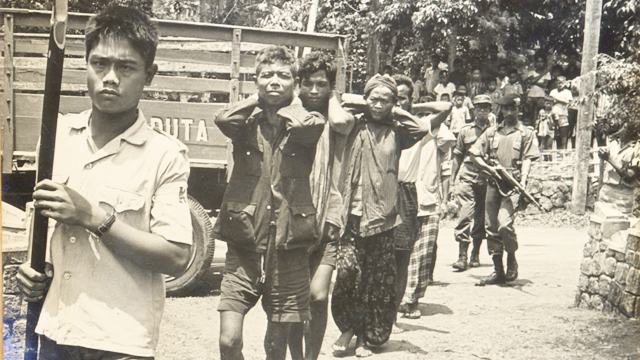 PKI members and sympathizers detained by the army in Bali, ca. December 1965. Source: National Library of Indonesia. 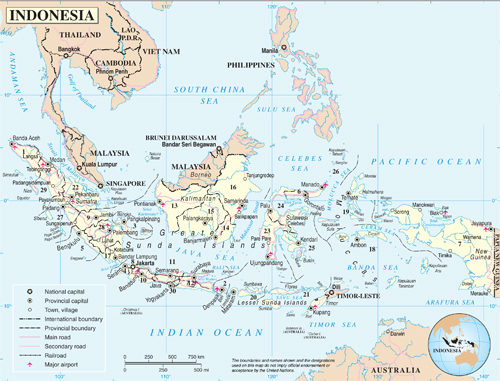 The slaughter of 500,000 communists and the incarceration of 1 million more in Indonesia in 1965–66 remains one of the least known and least examined mass killings of the 20th century, said Geoffrey Robinson at a recent CSEAS event. 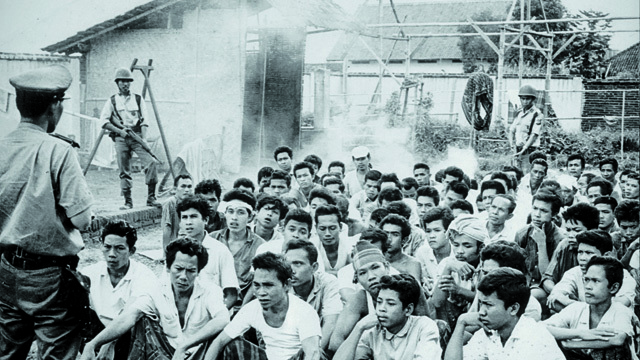 UCLA International Institute, May 23, 2018 — In the course of six months, from October 1965 through mid-1966, roughly half a million members of the Communist Party of Indonesia (Partai Komunis Indonesia, or PKI) were killed and another one million were detained without charge, said Geoffrey Robinson at UCLA on April 25, 2018. To date, no one has been held accountable for the mass violence. The Indonesian army’s account of the events, notable for its extreme demonization of Indonesian communists, has been propagated in the country for over 50 years and is now widely accepted. That history, said Robinson, has been supported by the enduring silence of the two major international powers whose implicit and explicit support made the 1965–66 violence possible: the United States and the United Kingdom. Indonesia. Based on UN Map No. 4110, Rev. 4, January 2004. A professor of history at UCLA and a human rights expert who has worked for Amnesty International and the United Nations, Robinson spoke about his recently published book, “The Killing Season: A History of the Indonesian Massacres, 1965–66” (Princeton, 2018) at an event cosponsored by the Center for Southeast Asian Studies (CSEAS) and the UCLA department of history. The culmination of 30 years of work, the book is based on declassified documents from the archives of seven or eight foreign countries, as well as fieldwork and interviews conducted in Indonesia by Robinson, as well as by two of his dissertation advisors, Ben Anderson and George Kahin. (The latter conducted interviews in the country immediately following the 1965 coup, but never published the materials). “The targets of [the 1965–66] violence were ordinary people: farmers, day laborers, teachers, civil servants,” said Robinson. “And they were killed in some pretty gruesome ways: they were decapitated, some were castrated and their dismembered bodies were left in public places. “This was, I stress, not a civil war,” remarked the author. “Those killed and detained were not armed and they had not committed a crime. All of them belonged to what were at the time lawful political and social organizations. Although the PKI was not in power, it supported Sukarno’s government and the president was in turn sympathetic to the party, noted Robinson. At the time, he said, the PKI was the largest non-governing communist party in the world, with 3.5 million members and perhaps 20 million supporters in affiliated organizations. 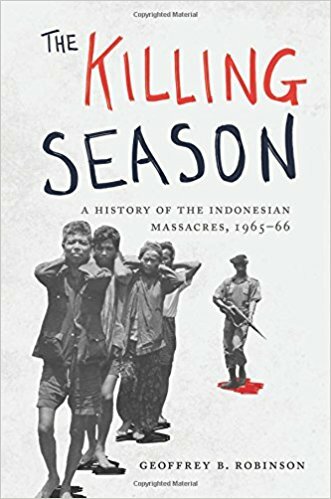 Robinson attributed the mass violence of 1965–66 to three major dynamics: certain historical conditions and antecedents related to Indonesian political life, the army’s leadership and the influence of powerful external states. He concentrated his remarks on the latter two dynamics, which he considered most significant. because it seized and remained in power for over 40 years. Robinson attributed the remarkable uniformity of the violence used in the mass killings throughout the country — disappearances, sexual violence, decapitation and corpse mutilation and display (what he called the army’s “repertoire of violence”) — to the army’s central role in mobilizing the militias that carried out the killings. Powerful external actors were complicit in both the Indonesian genocide and its cover-up, he said. “There is now abundant documentary evidence that, for at least a decade before 1965, the United States and other western powers, worked assiduously to undermine — in fact, to overthrow — [President] Sukarno and to destroy the PKI,” he said. “What did that mean?” asked Robinson. “Among other things, [it meant] provoking a premature or bogus left-wing coup that would provide an ideal pretext for a military intervention in the name of saving the country. And that indeed, is exactly what happened,” he concluded. 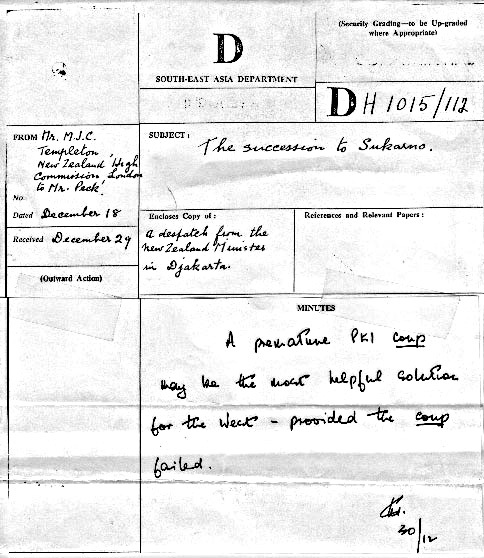 may be the most helpful solution for the West – provided the coup failed.” Source: UK National Archive. “Available evidence shows in the months and weeks following the supposed coup, the U.S. and its allies actively encouraged and facilitated the mounting violence,” he added. They did this in a number of ways: through a covert campaign of disinformation and propaganda designed explicitly to “blacken the name” of the PKI; through the provision of covert economic, logistical and military assistance to the army leadership; and through a policy of deliberate silence in the face of what they knew to be widespread army-instigated violence against civilians. That support continued, and in fact increased, said the speaker, even as it became clear that many thousands of civilians were being killed. The Cold War and the broader international political context — including U.S. policy makers’ fear that communists could take power in both Indonesia and Vietnam (where U.S. ground troops were introduced in 1965) — played a fundamental role in the Indonesian violence, said the historian. “That context dominated the domestic political scene in Indonesia, helping to create the highly polarized left-right division that was one precondition for mass violence,” he explained. Finally, the author contended that the weakness of international human rights norms, institutions and networks in the mid-1960s was an additional factor that made the violence possible. 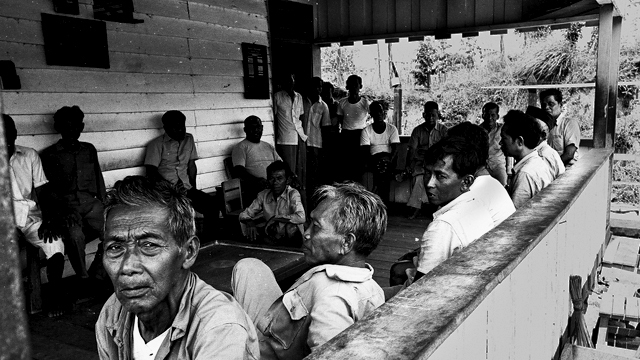 Political detainees at Sumber-Rejo prison camp, East Kalimantan, 1977. Photo: David Jenkins. Pondering the lack of accountability and long silence that has surrounded the 1965–66 killings, Robinson said succinctly, “Power matters.… As long as those responsible for crimes remain in power, the processes of truth seeking, justice, reconciliation, compensation and memorialization are not likely to happen. “Where powerful external states are complicit in crimes against humanity and in their continued cover-up, as in Indonesia,” he added, “the prospects for accountability become ever more remote,” he said.